Facebook users found this photo of a simple wooden crate, with the words "Made in China" interesting, this makes me curious as to why? "Happiness is found in simple things, which are not simple to find." 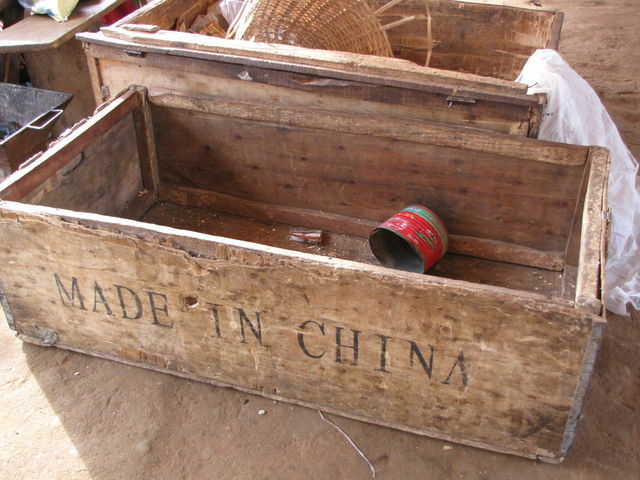 I was buying a baguette in Natitingou, Benin yesterday, when I looked down to discover this wood shipping crate with the wrods "Made In China" stamped on the side. For unknown reasons to me, I decided to put on Facebook, I just enjoy the photo, it makes me happy, so I shared it. And to my surprise, other people on Facebook also liked the photo. This is why I travel the world, to discover what is right in front of my eyes, but never revealed until I leave home.